VANCOUVER — The smile says it all for Kendyl Carson. A simple, fundamentally sound pass to a teammate that leads to an easy bucket is followed by a smile. A cross-over move for a layup and two more points brings a smile, too. Even when she is called for a foul, when she is handing the ball back to the official, there it is again. That smile. “I just love being out on the court,” Carson said. Especially after last season when she was ineligible for varsity basketball and had to play on the Prairie JV squad. This year, Carson is all smiles, helping the Falcons to an 18-1 record with one to play in the regular season. Prairie topped Mountain View on Monday to win at least of the Class 3A Greater St. Helens League. It is the 22nd consecutive league title for the Falcons. That is a true legacy there, but Carson was unaware of Prairie’s past until she showed up in Clark County. She played varsity basketball as a freshman in her home in Juneau, Alaska. She also had joined a club team based in Seattle, and her family thought it best that Carson move closer to the club. Her parents stayed behind in Alaska, and Kendyl moved in with relatives in Clark County. “I wasn’t too excited about moving here,” she conceded. Until she got to practice with the Falcons. “As soon as I got to play, I knew this is where I wanted to stay,” she said. Practice is all she could do last year with the varsity, though. Ineligible for varsity play for one year due to WIAA transfer rules, she practiced with the big squad but played for the JV team, waiting for her time. The Falcons, who have two Division I signees and a host of other talented players, share the ball every game. No one athlete really stands out statistically, and that is by the team’s design. Make no mistake, though, Carson can play. Of course, the Falcons knew that going in to this season. Prairie coach Hala Corral said Carson would have been a varsity player last season if eligible. Carson said she was disappointed in the ruling last season, but then just tried to take advantage of a new opportunity. This year, she is teammates with them on game day, not just at practice. 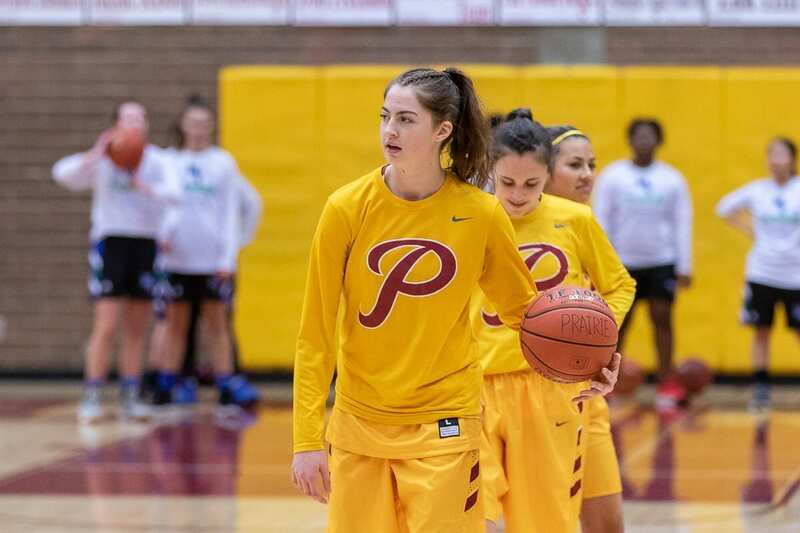 Carson’s favorite game this season was Prairie’s 81-26 win over Rogers of Puyallup, a 4A program that has made it to the state regional round the past three years. As of Monday night, Prairie was ranked No. 1 in Class 3A RPI. The Seattle Times also has the Falcons atop its rankings. Kendyl Carson, a junior from Prairie, said the goal this season is to earn a championship ring. That would be fitting for the team’s three seniors, she said, who have done so much to lead this squad. “The dream finish is to have a ring on my finger,” Carson said. It is more important, she said, to send the three seniors off with a title. Gardner, Walling, and Mallory Williams, Carson said, have held this team together all season. The Falcons will take on Hudson’s Bay on Wednesday in the regular-season finale. Bay, having its best season in years, is the only team in the league that has come close against the Falcons. Once league play is done, Prairie will advance to bi-district to try to clinch a berth to state. All of the Falcons have waited a long time to go on this playoff run. For Carson, the wait was a little bit longer. She is all smiles now, though. Happy to be at Prairie, happy to be on the varsity court again. 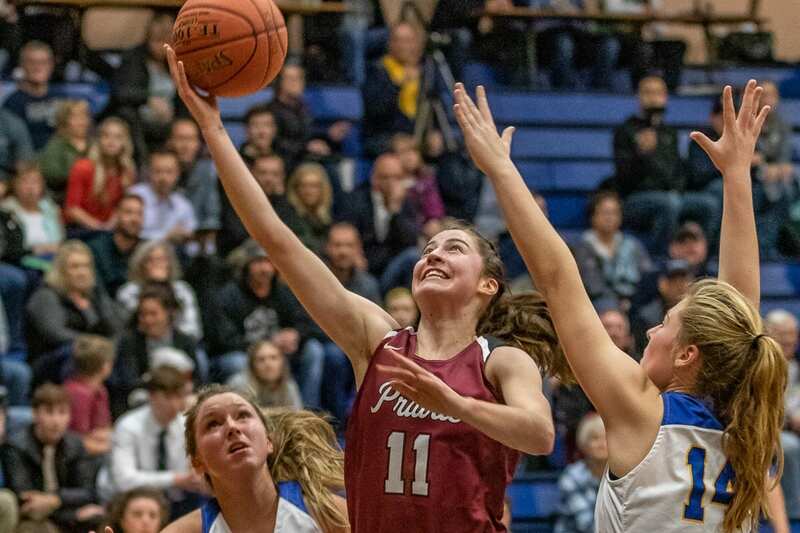 Here is a roundup of the top teams in each league as the girls and boys basketball regular seasons conclude this week or early next week. Class 4A boys: Union has clinched at least a share of the title. The Titans host Skyview on Wednesday. The Storm need a win to become co-champions with the Titans. Class 4A girls: Camas and Union are tied atop the league standings, each at 6-1. They split their games. If both win on Wednesday, they will share the league title and play a tiebreaker for seeding. Class 3A boys: Kelso moved to 8-1 with one to play with a win Monday. The Hilanders have clinched at least a share of the league title. Prairie is 7-2, a game back. 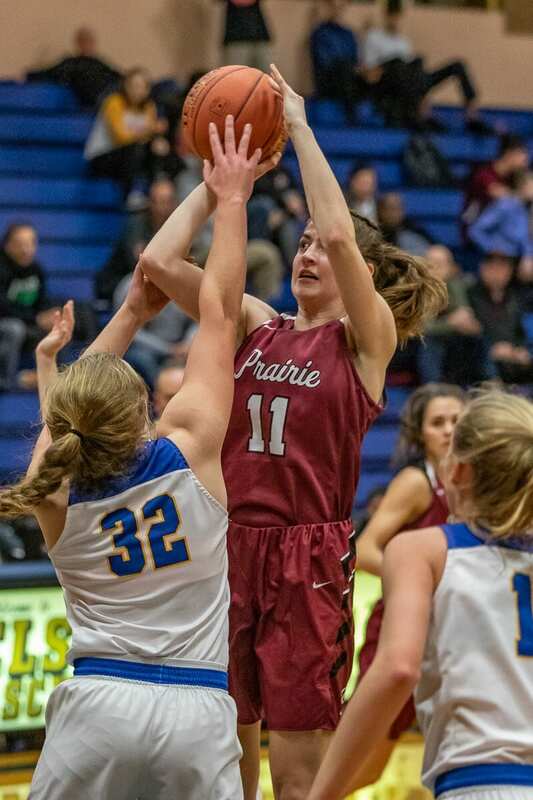 Class 3A girls: Prairie has clinched at least a share of the league title. The Falcons take on Hudson’s Bay on Wednesday. The Eagles would love to upset the Falcons for a share of the league title. Class 2A boys: Columbia River, 9-0, has already clinched at least a share of the league title and has the top seed. With three games to play, River needs one win to win the league outright. Expect that to happen. Class 2A girls: Washougal seemingly clinched the league title a long time ago. The Panthers are 10-0, with Columbia River and Woodland tied for second, four games back. Trico boys: King’s Way Christian and La Center enter the week tied at 7-1. Both play on Wednesday, and they face each other Friday. Trico girls: King’s Way Christian has already clinched at least a share of the league title and has secured the No. 1 seed to district. The Knights are expected to get a win Tuesday night for the outright title.